A small, old fashioned outdoor movie theater in northern Michigan was showing “Batman.” On the same road a few miles out of town was a sign offering a sale on guns and ammo. This town isn’t Chicago or Detroit, or as of this weekend, Aurora. The police scanner is quiet for many minutes. Bursts of static remind the town folks not to forget the scanner on the counter. It ripples with reports of stuff such as an assault outside a pickle factory. The dispatcher lets “pickle factory” hang in the air like a floating double down the left field line. If the Tigers are playing, the radio is certain to be turned to the game. The police scanner is on the shelf near the store’s left field line, next to the ice cream and lottery. The radio is muffled by the big bags of tobacco on the right field line. A church lady comes in and asks for tobacco. They talk church. I was shocked that the abandoned church of my favorite whiskey priest had been demolished. Holy crap, it’s gone, I thought, driving past the patch of dirt about the size of a pitching mound. A scratchy piece of dirt was all that remained of my whiskey priest’s life work. The church market has taken a bigger hit than the pickle factory and the Detroit Tigers bullpen. Church ladies chew tobacco and drink beer and gamble here. They can take what life throws at them better than the men. They’re probably the reason my whiskey priest split in search of cute soccer moms in metro Detroit. So I hope. But I have a suspicion he’s on a bar stool nearby. There are some tough towns in northern Michigan. A store sign targeted to truckers advertises showers, beer, and tools, in that order. Summer is making the turn into August and the pennant stretch. Sparky Anderson, the great manager of the Reds and Tigers, said no one ever won the pennant in July. The police dispatcher knows it. She is throwing strikes now, working the plate. Head injuries on a ballfield interrupted the static this weekend. A hard hit up the middle. Paramedics requested a helicopter to a bigger hospital several miles away. The dispatcher asked for the helicopter’s LZ and was told in the middle of the ballfield. She works the paramedics and police like a veteran on the mound, shaking off the catcher’s signals until she gets something she likes. The International Hemingway Society came to northern Michigan in late June for the annual meeting. Michigan’s Gold Coast gets most of the Summer People. The landing zone for the Summer People is Traverse City, Charlevoix, Petoskey. “Big cars out from Charlevoix, rich slobs riding behind their chauffeurs, came up and passed, hogging the road and not dimming their lights,” Hemingway wrote in the short story Summer People. The Hemingway Society bus tour to the Upper Peninsula was sold out. I’ll do it myself before summer is done. And try to watch a minor league baseball game. The Traverse City Beach Bums must be the coolest minor league team in the game. Another destination on the to see list is Misery Bay in the U.P. to check out the scene used by Steve Hamilton for his mystery Misery Bay. This town on the shore of Lake Superior isn’t a tourist destination for Summer People. Access by car is difficult. No one dreams of mermaids in Misery Bay like Nick did in Hemingway’s Summer People that was set in Hortons Bay. Swimming is character to Hemingway. Talking too much is more dangerous than swimming too much. You can talk yourself out of many good things like Nick did. A killer from metro Detroit made a run for the Upper Peninsula and got caught a few years ago. They found him shivering in the woods. The safe havens are on this side of the state, where my fictional whiskey priest is hiding. The 20th Century was the most violent and Hemingway and Graham Greene covered it as much as any novelist of their time. The bad guys were shooting up the world, not movie theaters. 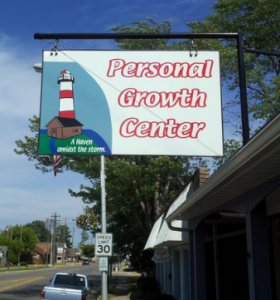 The Personal Growth Center is on the same road as the sign for guns and ammo and the movie theater showing “Batman.” This safe haven was closed when I took a picture of the sign. Play dead on the weekend. Come back on Monday during regular business hours. The store offering showers, beer, and tools is open 24 hours a day.